The Moving Picture Blog: Thanks for nothing, Mr. Moviefone! 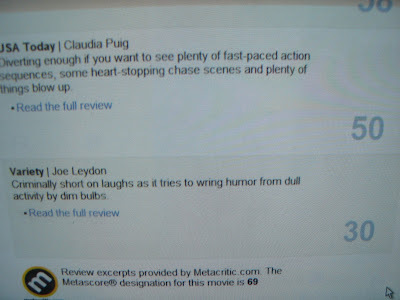 Since the review excerpts at Moviefone are provided by Metacritic.com, maybe you ought to let *them* know about their flub. (I see that they do have a "contact us" link on their website.) And, Joe, I hope they can get a correction out before any of those rabid Die Hard lovin' emailers form a posse and track you down! Calling these knuckle-dragging mouth breathers "functionally illiterate" is a bit of a contradiction in terms, eh? How can one be illiterate and "functional", in the grander scheme of things, at the same time?